Often used in combination with the Invisiware® receiver (page 9), this fitting is also hidden inside the end post with only the head exposed on the outside of the post. Often used in combination with the Invisiware® receiver, this fitting is also hidden inside the end post with only the head exposed on the outside of the post. When installed, it looks the same as the Invisiware® receiver except it costs much less. 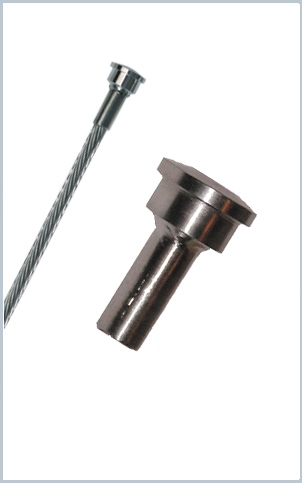 Invisiware® radius ferrules are used with pipe and with round, square or rectangular metal tubing. Pipe ends are counterbored, so the full perimeter of the head rests on a flat surface in the pipe. The head rests on the outside wall of a flat-sided metal post. A plastic washer is included and acts as a scratch-resistant barrier between the head of the fitting and the metal post. For use in wood, the Invisiware® radius ferrule can rest against the outside of the post or the post can be counterbored with the radius ferrule recessed in the post. For wood applications, also order stainless steel washer.